The Maple is LeafLabs' 32-bit ARM development board. 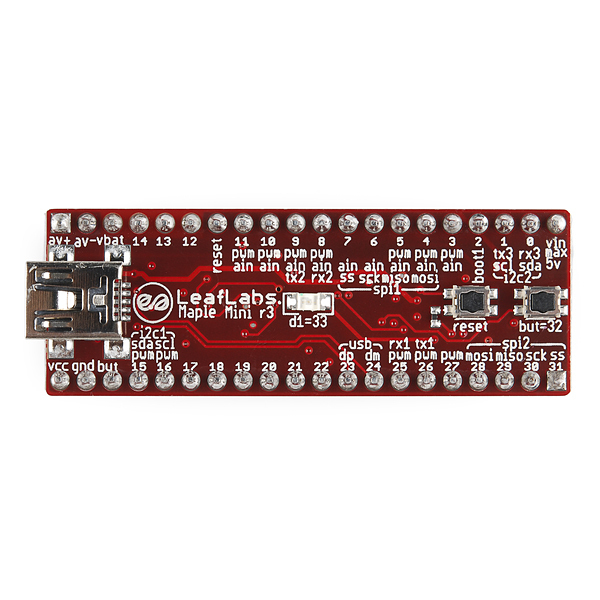 Coupled with the Maple IDE, the LeafLabs Maple line of development boards bring an Arduino style user experience to the world of powerful 32-bit ARM processors. 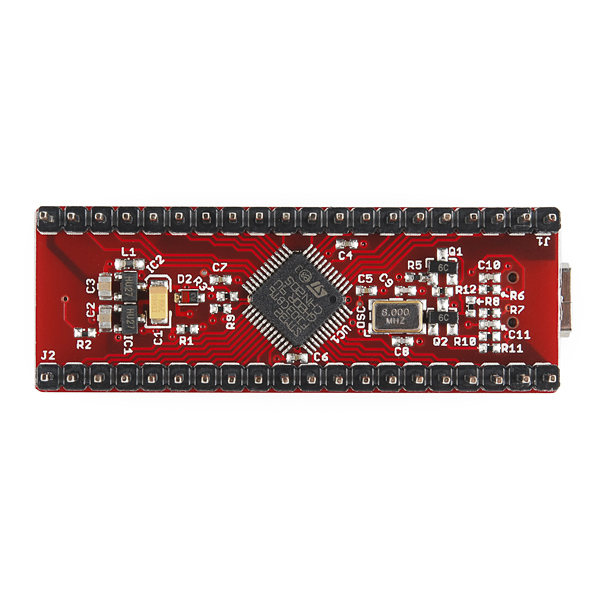 The Maple Mini is the breadboard friendly Maple development board featuring a smaller, 48-pin STM32 with the same speed and memory as the original Maple. Smaller than a stick of gum, the Maple Mini sports 120 KB Flash memory, 34 GPIOs and 20 KB of SRAM. The Maple IDE will make Processing/Arduino programmers feel right at home. By swapping the popular "avr-gcc" compiler with CodeSourcery's****"arm-none-eabi-gcc," LeafLabs manages to provide a nearly identical programming experience to Arduino despite targeting a completely different architecture. If your current Arduino-based project is pushing against the performance limits of the ATmega, porting it over to Maple may be the fastest and easiest way to continue developing your project without starting from scratch. And with the form-factor of the Maple Mini, prototyping will be a breeze. Wow that is one seriously shiny quarter. From the San Francisco mint, no less! ^--- With an E, as in no vendor. See this post on Stack Overflow for an explanation of the compiler naming convention. Feel free to delete this comment after you've made the correction. The page for the "Maple", from which this description was likely copied, also has the same error. Looks like the original source of the error is us; fixed. Hey guys! I have a question regarding the MapleLeaf mini GPIOs. I am not able to toggle them properly. I tried toggling pin 13 through code and instead pin 6 was toggled. Here is a list of what I tried to toggle and what got toggled instead. A quick review: This product is a b**** to work with when trying to get it to talk to other chipsets. The I2C libraries are broken (and openly admitted by Leaf Labs) and the ones that other folks have written have major timing issues due to a poor compiler. I suppose this microcontroller would be great if you were doing things like motor control for a small robot, but anything beyond that, it is nearly useless. After about 65 hours of trying to debug this, I just gave up and bought an Arduino Due. The documentation is poor, the libraries are incomplete, and I would not suggest this product. Sorry. 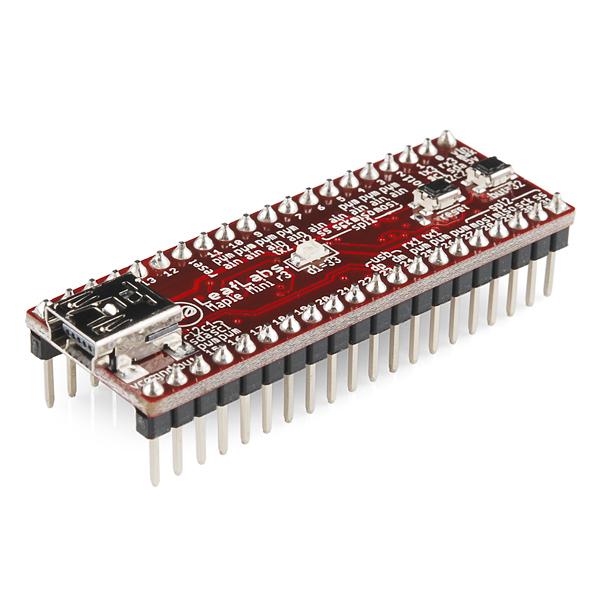 Do you said that the PN is STM32F103CBT6. The datasheet says "2.0 to 3.6 V application supply and I/Os". Is also says that "26/37/51/80 I/Os, all mappable on 16 external interrupt vectors and almost all 5 V-tolerant". So what that feature "Input Voltage (recommended): 3.0V-12V" means? 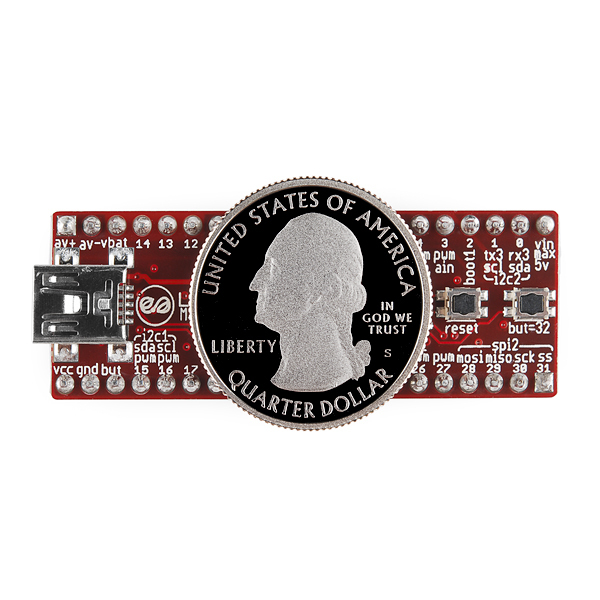 The processor needs to be powered by 2.0 to 3.6 V. Instead of requiring you to supply a voltage in that range (although you can, if you want to), the maple mini also includes a regulator that converts any input voltage from 3V to 12V down to within that 2.0 to 3.6V range. This board is really nice. The STM32 is a really powerful device. I'm really enthusiastic thinking about an Arduino-like community around the Cortex-M3! does anyone know if you can program this using atmel studio ? Finally got it to work. A little bit of pain, but all is well. Has anyone used this device on a windows 7 system? I can't get it to work. I followed the advice at LeafLabs but it didnt work. So can I use your PyMite to code this? Actual chip is the STM32F103 C (48 pins) B (128 K) T (LQFT) 6 (-40 to +85 C). One thing I've often wondered, why have I never seen anyone produce a 5 volt arm dev board? Do they just not make arm cores in 5 volt? Every (almost) widget, breakout, sensor or whatchamacallit from sparkfun, adafruit, etc is 5 volt. This is a proverbial wrench for anyone wanting to move up from an arduino and get their feet wet with an arm chip. If you need 5v for a particular application and ARM-like performance, an AVR UC3 might work. Some 5v versions are available (the ones with CAN). The Psoc5 series (M3 core) is 5 V I/O--I think 2.7-5 or so, and user selectable. 5V has more range for analog, as I understand it. Now, if someone would only make a nice low cost break out for it..
3.3 is here to stay. Fortunately, 3.3 5 interoperation is often transparent since virtually all 3.3 V microcontrollers will accept 5 V inputs on some or all I/Os and can drive TTL-compatible loads just fine. As always, check the data sheet. The STM32F10x minimum guaranteed output level for a logic high into a TTL load is 2.4 V, and the guaranteed minimum input threshold for older TTL and modern HCT TTL-like parts is 2.0 V, so it's good to go, modulo noise margin etc. Not all STM32F10x inputs are 5 V compatible so again, check the data sheet. A voltage divider may be all that's necessary. This looks like an awesome product. It is also priced to sell. Does it use a version of the Cortex M3 without ethernet support? The mbed has ethernet. The mbed is also stuck with that weird "online IDE" thing, so even if it cost $5 and offered every imaginable feature, it'd still be unworthy of consideration for anything I'm ever likely to do. is this arduino ide compatible? no, it uses its own IDE. Oh, so YOU were the ones responsible for the shortage! This is a great board with a very fast little processor inside it. I would highly recommend it for general digital pin work. It is particularly great when doing large computational loads like FFTs. Where this board has issues is with I2C. The Leaf Labs team has made mention of trying to fix these issues, but it (as of writing this review) is yet to be seen. So, if you need to talk to an ADC, an IMU, a digital potentiometer, or many other things, you will be fast out of luck.